We think of this post as a hybrid for speakers that aren’t just exclusively for the outdoors, but are also Bluetooth. Small speakers come in different shapes and sizes. But from what we’ve observed, most of the smaller outdoor speakers aren’t Bluetooth. And the “outdoor” speakers that look like they’re actual rock is heavy-duty and large. The standard we set for a “small” outdoor speaker is anything that weighs 10 pounds or less. We might make a few exceptions here and there depending on how easy the manufacturers make carrying the speaker around. Or we might include a speaker just because we think it’s solid even if it might go over our 10 pound limit by .1. Weighing in at 5.65 pounds is the Insignia. What’s cool about this product is the set comes with 2 speakers. This is what enhances its audio qualities. But when you listen to them, the sound doesn’t sound like it’s coming from 2 speakers, it sounds like it’s coming from 1 speaker. When the speakers play, whether it’s a low-tone or a high-tone doesn’t matter because it sounds crisp either way. Coming in at 60 watts of peak power, this speaker delivers solid audio quality. 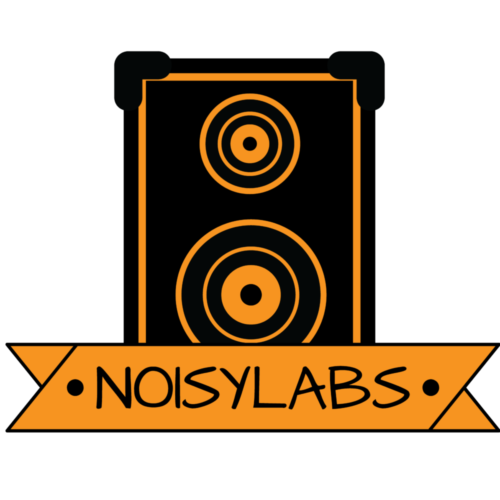 To deliver that sound is a 4-inch polypropylene woofer and a 1/2-inch Mylar tweeter. Although the design on this speaker is bland, it doesn’t mean performance will suffer. It’s a solid small outdoor speaker to have in your backyard or patio. 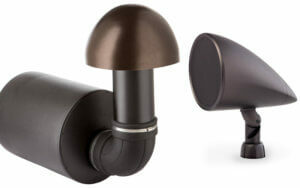 If you’re looking for a small weatherproof outdoor speaker then this is your choice. And it can stand up to any outdoor weather condition including rain, mud, or snow. A key feature to its durability is its nickel-plated brass. Brass is a strong alloy mixed between zinc and copper. A nickel-plated brass, in this case, is just brass covered by nickel. But to attach the nickel to the brass there’s a process called electroplating. Simply put, electroplating for nickel is just the process of putting nickel onto metal. Add the fact that the enclosure is made up of fiberglass and you have a metal tank in your backyard. 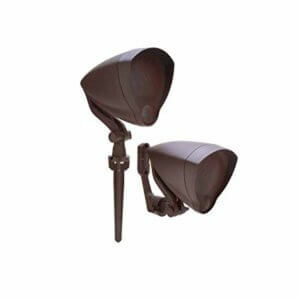 Another part that makes this outdoor speaker appealing is its versatility. Do you want the speaker on a flat surface? How about up on the wall? There’s a wall mount for that. What about if I wanted to plant it in the ground? When you look at the speaker it looks deceiving. It looks small and flimsy but its Teteron tweeter provides a wide dispersion to bring sound to all of the outdoor environment it’s in. There is a feature called adjustable tap switch. It enables the satellites to move at different Ohms (faster or slower). It’s a nice feature depending on how you like the cadence on your music. This also lets different speakers play at different volumes. Say you have a speaker by the pool and another one on the patio. Since the acoustics are harder to cover at the pool, you adjust those speakers to be louder and the ones on the patio can be at a lower level. Overall, this is a unique speaker from the mere fact it doesn’t even look like a speaker. 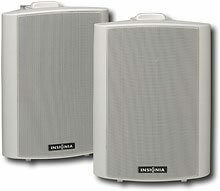 But other than that, you have a lot of features that separates itself from other small outdoor speakers. This speaker barely makes the cut because it’s at 9.75 pounds. If a small granite rock were to sit on it then it would be 10 pounds hahaha. MartinLogan is not an infamous brand when it comes to small outdoor speakers but they have a nice selection when you do some research on them. Each speaker, especially this one is weatherproof and comes with a unique design. Any individual satellite speaker is sealed, molded in fade-resistant thermoplastic, and blends in great with any outdoor decor you have. MartinLogan promises exceptional delivery of audio by making the speaker dynamic and organic when music comes out. By organic, they mean it sounds exactly how the record was produced. Either that or it’ll sound exactly like how the music source plays it. A quick example to this is when you stream from your phone, when it plays on the Outdoor Sat 60, it’ll sound the same, or better. The “mushroom cap” you see on top of the speaker is another feature differentiating itself from the small outdoor speaker market. If you were to plant the speaker in the ground then the mushroom cap is all you’d see. It’s a big part of what makes the speaker a chameleon in your outdoor space. Bringing it back to durability, the Outdoor Sat 60 works well in opposite ends of the temperature scale. Engineers who’ve tested the speaker confirmed it can work in a -20 degree or 185 degree environment. You can literally be in the North Pole or the desert and it’ll still work. Another nod to its durability is the polyethylene it’s made out of. This is the same material used for underground water systems, consumer products, and the automotive industry. With the combination of polypropylene woofers and its magnet structure, this duo results in a deep bass where the internal components don’t vibrate. Usually, speakers have components inside its enclosure, and when it starts vibrating without a strong magnetic structure, it’ll result in resonance causing sound disruption. But this speaker doesn’t have that because of its magnetic structure. A 2nd order result because of this magnetic structure is no “chuffing”. Chuffing is a sound created by a port tube when the bass driver is working. Because of its great bass, a lot of large Bluetooth speakers can emit chuffing. Simply put, chuffing is when large amounts of air go into a speaker port. The solution is to alter the speed at which the air comes in. It’s just like an intersection full of cars. If there are too many cars going one way then how are the other cars suppose to go? The key is the stoplight. The ability of the Outdoor Sat 60 to regulate air movement is impressive. It’s like it has its own air conditioning system. In addition to its size, you can also place it in many different areas. Whether you want it on the ground or the walls, either is possible. The Outdoor Sat 60 has 3 different mounts all because of the “Quick Twist Cap”. The first is called the 12-inch Ground Stake. With this mount, you can place this small outdoor speaker on the ground (obviously). If you have a nice little garden in the backyard, you can neatly place this speaker in there. Second is the “Surface Mount Bracket” which helps you place the speaker on decks and walls. The third option is the “Burial Conduit Junction”, and this helps you bury your speaker underground. Wherever you prefer, this all-in-one speaker has it all when it comes to mobility, audio, and design. We had to make an exception for this one even though it weighs in at 10.2 pounds. To be honest, the design isn’t anything spectacular. When you get a glimpse of it you’d think nothing of it other than that’s a speaker. Truth is this speaker is highly reliable to be an outdoor speaker (or else why would we recommend it). Its compact size is basic, but simple which makes it reliable. You don’t need to think too hard on where it can fit assuming you have space outside. If you happen to buy it then you’ll get wall mount to help you set it up. It also has other features that make it dependable. Reliability, in this case, is also synonymous with durability. This speaker is weatherproof and also comes with a cover when you purchase it. If you place it on your wall and it were to drop, then don’t fret, your purchase comes with a warranty. Now, we know what you’re saying. Every speaker comes with a warranty! What separates this speaker from the pack is its weatherproof system. A patented grille on its front and a strong alloy metal covering it combined with its size is the weatherproof system. It’s like a 3-in-1 package to keep your speaker safe. Now that we’ve gone on about its durability, we’re going to talk about its sound. Its woofers are propylene which usually means its resistant to resonance and it’s durable. Although the debate between horn tweeters and dome tweeters will rage on until the end of time for audiophiles, it’s safe to say each side has its pros and cons. 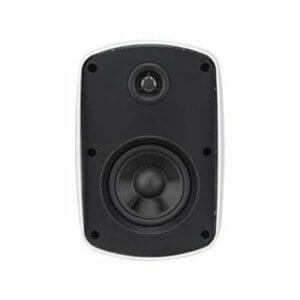 For this speaker though, a unique dual 1-inch dome tweeter gives it the ability to cover a wide area. And when you think of wide areas in your household, a patio or backyard is probably the widest area. What most people (including us) doesn’t expect is the amount of power this speaker generates. At a 120 watts (maximum capability), you won’t have a problem generating music and pumping volume. Beware of sound disruption though. 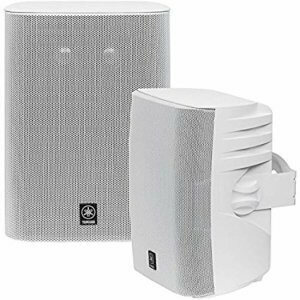 When a small speaker brings a lot of power, sound disruption will ensue because the tiny speaker’s enclosures can’t handle it. Playing more volume than the specifications allow causes voice coils to burn and also causes sound hissing. think of it like a little kid. Sometimes kids have more energy than they can handle leading to trouble. Overall, we would definitely recommend this speaker. The only downside we can think of is the design. It covers audio and durability which means it covers the most important core factors. Russound is a worldwide brand that aligns itself with quality hi-fi solutions. Their original product line included speaker selectors and volume controls. As they grew, so did their product line. Now their products include outdoor speakers, amplifiers, and more. Since their inception, quality has been their mantra, and there’s no difference with this speaker. A key feature to this product is its high-efficiency design. And do you know why high-efficiency is good? Its because high-efficiency means less power is required. And when less power is required, the less chance there is of your speakers blowing out from pumping too much volume in. We’ve talked about its ancillary features, now let’s get into the core features. Let’s get into that right now. The materials and design used for this speaker are engineered for peak performance. A combination of kevlar, polypropylene, and silk are all used to ensure the speaker lasts a long time. To back this statement up, engineers tested the speakers in temperatures that were really cold, and really hot. In cold temperatures, speakers tend to freeze up, resulting in speakers that don’t work. During the tests on the Russound, that didn’t happen. On the other hand, during hot temperatures, speakers experiences corrosion because of the moisture due to humidity. But since the enclosure is sealed tight, both cold and hot weather have little to no effect on the Russound 5B65WHITE 5B65. Even though Russound isn’t as popular as other brands, they still stick to their mission of quality with a great speaker. Similar to the other small outdoor speakers here, this speaker is meant to blend in the scenery. Its weight of 4 pounds makes it lightweight and accessible. In comparison to the other speakers on here, it’s lightweight and portability makes it easy to move around your outdoor space. But one caveat tiny outdoor speakers have is audio. So let’s understand what kind of specifications this speaker has. As you would’ve guessed, its audio doesn’t provide as much power as the other tiny outdoor speakers here, and that’s to be expected. Its wattage power ranges from 5-60 watts. A wide range like this is concerning because you don’t know what you’re going to get. To supplement its low power we recommend purchasing a subwoofer. It works great with omnisub200 subwoofers. Besides its wattage power, it also has a sensitivity of 89 decibels and an impedance of 8ohms. Unlike other speakers on here, it has a different type of cone. What it has is an aluminum cone. Some would appreciate this but aluminum cones come with disadvantages just like any other type of material. With metal cones you get poor damping and a peak you can hear with the crossover. As you read from the last sentence, metal cones get poor damping. But they’re also not as durable as polyethylene woofers or man-made fabrics. 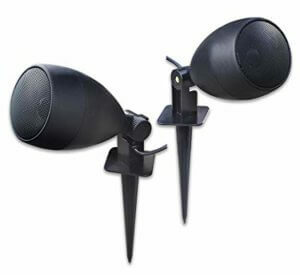 These speakers specifically are known to be weatherproof with sealed enclosures so they can fight against moisture. Other than this, there isn’t much to speak of. Everything is standard when it comes to the OSD Audio. If you’re looking for a cheaper option then this is the one. But if you want something that’ll stand out then we recommend purchasing the speakers above.